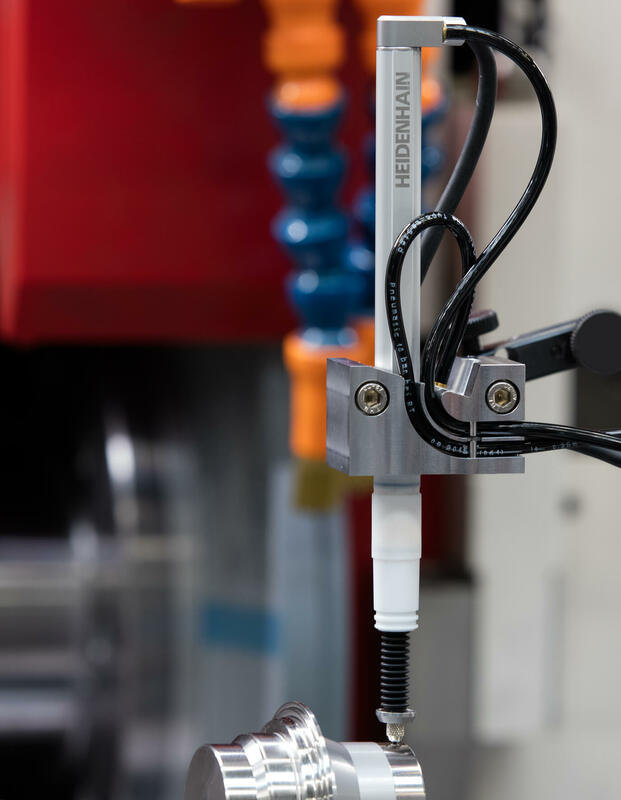 SCHAUMBURG, IL (October 2017) – HEIDENHAIN CORPORATION is pleased to introduce the new HEIDENHAIN-SPECTO ST 3087 RC length gauge, optimally designed for measurement applications in harsh environments, e.g., in metal-cutting production areas. It has an IP 67 level ingress protection to allow parts to be measured directly at the grinding, cutting, or forming location, instead of removing them to quality islands or laboratories. This saves time and money through significantly reduced time, cost and transportation. The HEIDENHAIN-SPECTO ST 3087 RC gauge has a special housing for in-process measurements. In the plunger rest position, it houses the plunger and a rubber bellows surrounding the plunger, as well as a splash guard cap to close the exit opening for the plunger in the housing. For a measurement, which is normally made when the cooling lubricant is switched off, only the plunger and its bellows extend out of the housing, driven by compressed air. The optical scanning provides high-accurate position values with a maximum error of ±1 μm over a 30-mm measuring range. Thanks to its stroke of 30 mm and its high accuracy over its entire measuring range, it can measure diverse components from the same fixture. In addition, the optical scanning together with the ball guide also permits consistent repeatability when scanning oblique surfaces. The cycle time for measurements is below 1.5 s.
An important component of accurate manufacturing is and has always been well functioning measuring technology. However, up to now it has often been isolated to quality islands or labs rather than fully integrated into the ongoing process. The new HEIDENHAIN-SPECTO ST 3087 RC increases productivity and efficiency by enabling the integration of this highly accurate measuring device directly into an extremely contaminated production process. For more information, contact Stuart Graham, HEIDENHAIN’s Product Specialist, Metrology Division at 847-519-3296.